When your work for a nonprofit, you are always looking for free services your organization can take utilize to continue raising awareness and gain supporters for your cause. While many corporations offer services, software and other application to shows support for various nonprofits, Google AdWords may be the most valuable. If your nonprofit isn’t already taking advantage of this service, it’s time to start benefiting from a free AdWords campaign. Simply put, Google Grants offer free in-kind AdWords advertising services to 501(c)(3) nonprofits, up to $10,000 USD worth per month. The AdWords platform offers a streamlined way to get your organization’s story and mission in front of your target audience, increasing visibility, supporters, and donations. AdWords could be a huge boost for your nonprofit. 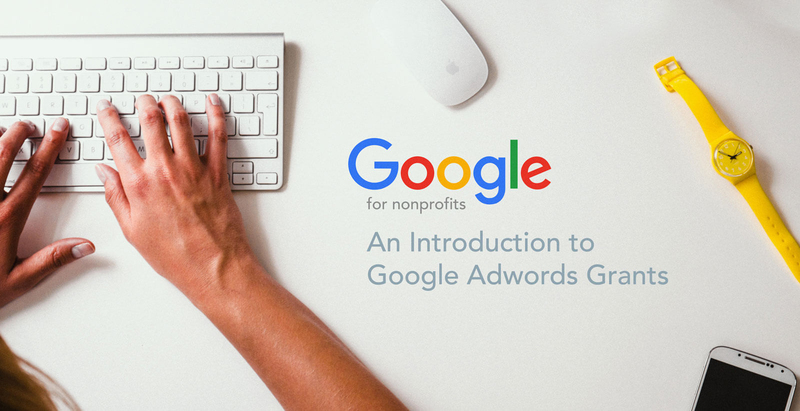 What are AdWords and Why Does Your Nonprofit Need It? Not sure what Google AdWords is? It is a valuable tool that allows your nonprofit to distribute ads throughout the web. This advertising will supplement SEO by driving traffic to your organization’s website at an accelerated pace. It will also build and strengthen your brand with your target audience. There’s no doubt that Google is an expert when it comes to advertising. The largest in the world with an 80% global reach, their ad network will provide high visibility for the ads created by your organization. AdWords will allow your nonprofit’s message to reach a larger audience. With Google’s customizable tools, that message will reach those most likely to engage and donate, locally and internationally. Don’t worry, you don’t have to be an AdWords expert. AdWords Express allows even the most unskilled beginner to launch an effective campaign. A fast and simple version of AdWords, Express offers automated management service. This enables those who are new to AdWords to still fully optimize their campaigns. Once users gain experience, AdWords offers insights to monitor ad performance, keyword strength, and various other analytical areas. There are some requirements to meet before taking advantage of Google Grants AdWords. The good news is just maintain eligibility and your Google Grant will never expire! -Your nonprofit’s headquarters must be in one of the 50+ eligible countries. -In the US, your nonprofit must have current 501(c)(3) status. -Internationally, your nonprofit must meet the defined charity status of your country. -Of course, you must have a live website with substantial content. Google requires more than just a couple of pages. -Some types of organizations are prohibited and cannot receive assistance through Google Grants. Among these are governmental health entities, hospital or health care organizations, and academic institutions. Where Does Your Nonprofit Sign Up? Once your organization has established that it is eligible, sign up with a Google for Nonprofits account. There your organization can become a member for access to free tools and services like Google Apps and Google Analytics. Enroll in Google Ad Grants and complete the application. Depending on your level of expertise, sign up for either AdWords or AdWords Express to maintain your ad campaign. Google’s account creation guide makes it easy to create an account that fits your needs. Be prepared though, the process may take between 4–6 hours to complete. Along with basic information about your organization, you will need an idea of how you intend to start your ad campaign. Google will request sample keywords and ad copy as well as the purpose of your ad campaign. Will your organization be recruiting additional volunteers, getting more donations, promoting fundraisers, etc.? Submit your account to be reviewed. The Google for Nonprofits team will take it from there by verifying your eligibility and going over your application. Be prepared to wait. Run by volunteers, the process takes approximately 4–6 months. Should Your Nonprofit Manage Its Own AdWords Campaign? If no one in your organization has experience with AdWords, it may be difficult to get the best results possible, even with $10,000 worth of services at your disposal. Developing effective strategies to get the most from the AdWords platform takes time and know how. You may want to opt for AdWords Express automated management service. It would be a shame for the grant money to be wasted on only a few new visitors to your website each month. Once your organization has applied for Google Grants, it might be time to reevaluate your website. Even if it meets Google’s basic requirements or if you fear it falls short, Creative Click Media has just announced its Ultimate Website-For-A-Cause Giveaway. Enter April 1st thru April 30th 2016. This marketing makeover and optimization of your digital presence could help your organization reach the next level, Google Grantspro, offering up to $40,000 worth of in-kind AdWords services per month. Adam Binder is founder of Creative Click Media, helping businesses and organizations to realize their fullest potential through innovative digital marketing efforts.